Here we go. Actual predictions, before the event this time! Radical idea I know. As usual, if you'd like to know how this is all done, click here and scroll though some past posts. I get team line-ups from Fantasy Football Scout. EPL Index provides all the player performance data. Footballdata.co.uk provides past betting odds and game results. I'm excited this week because I've managed to improve prediction accuracy in the model after a few false starts, where I thought I had, but it turned out to be programming bugs and/or random errors. The model's now learned about opposition strength and it will modify the expected performance for each player's passing accuracy and number of touches, based on who they're playing against. It means for example that teams will find it much easier to pass the ball to their strikers and create scoring chances against QPR, than against Spurs. Exactly how it does that I'll save for another day, but it's got regression models in it and I'm quite proud of the way it predicts! It's taken some serious effort to get working. 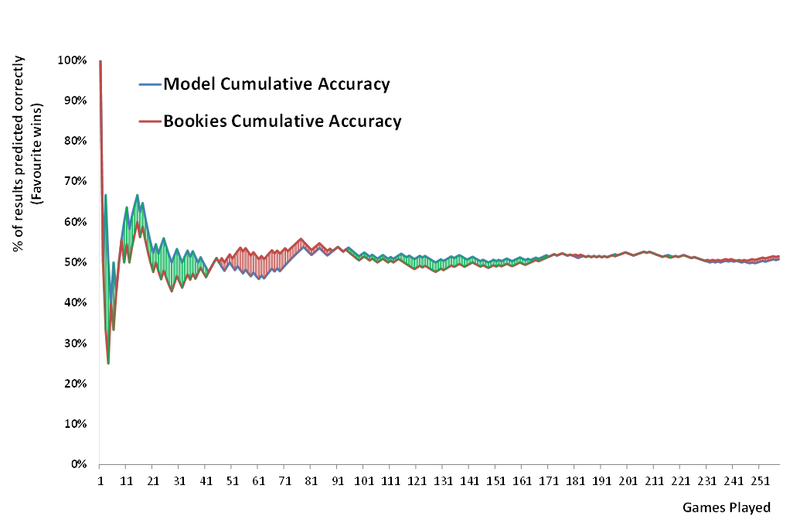 This is what the improvements have done to our cumulative prediction accuracy vs. the bookmakers over the season so far - how often the model's favourite wins vs. how often the bookmakers' favourite does. Green means the model was winning at that point in the season. It's not a huge leap in performance, but we're fighting for every fraction of a percentage point improvement from here. Enough methodology, here are this week's predictions. Actually, running across the season so far, this principle would have worked extremely well. I'm going to pick results where the model thinks an event is more likely than usual. E.g. the model averages 23% of matches ending in a draw (bit low that, as I've mentioned before), so we'll bet on a draw if the draw prediction for a single game is significantly higher than 23%. This has the immediate advantage that it allows us to bet on draws. As I've mentioned before, a draw is almost never the most likely single game outcome, but in total, 25-30% of games end in a draw. If you never bet on a draw, you'll definitely lose over a quarter of the time before you even start. 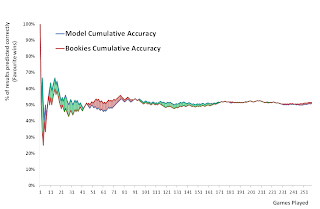 Overall, this method will call slightly fewer results right than just betting on the model's favourite. But. And it's a big But. It means we call far more long-shots correctly. Tottenham v Arsenal - Away win. And we'll see how that lot turn out next week.